HAVING been in the travel industry for about a decade, Datuk Abdullah Ahmad is often caught between his love for kampung food and the pleasant ambience of a hotel. 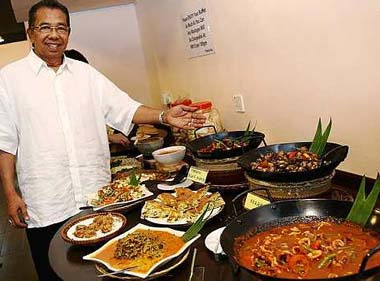 The hotel’s buffet corner always pleases him with a neat and clean layout set against a comfortable environment, but more often than not, the Malay cuisine served is less than satisfactory for him as it does not have the “kick” in kampung delights. Restoran Ayu Sofea, his first venture into the food and beverage industry, brings together the best of both worlds. Wide variety: Abdullah showing off the buffet spread. The restaurant in Damansara Utama serves Malay buffet lunch and dinner in a clean and organised way just like a hotel, but the delicacies are set to bring back the long- lost kampung flavours and the price is much more affordable than that of hotels. A la carte and Nasi Campur (mixed rice) are also available alongside the buffet. Diners can opt to have only the dishes they like from the buffet table to make their own Nasi Campur, while the a la carte selection range from fried rice, mee soup to local favourites. The restaurant’s posh interior had many customers worried that the food was expensive, but that notion was soon crushed and the restaurant has now garnered a large following. “I am very particular about my rendang and I like to have pulut in the morning just like how it is back home. 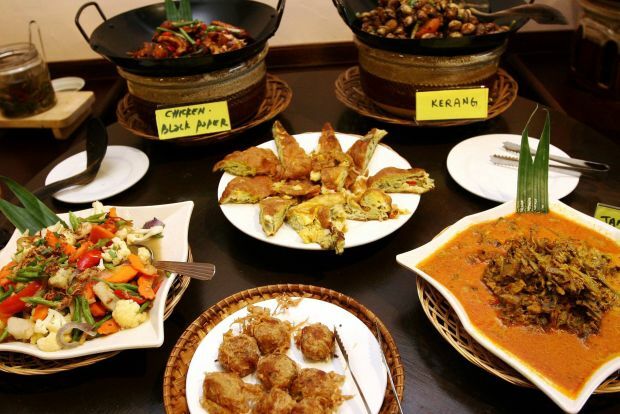 With that in mind, we put much care in the taste of the dishes even though they are served in a buffet,” said Abdullah, who hails from Bagan Datoh, Perak. “The flavours matter most to us, we are set to bring back the nice old kampung taste for our diners,” he added. The buffet menu changes daily, often depending on the availability of fresh ingredients at the market. Customers can rest assure that a balanced diet with sufficient choices of meat and vegetables in addition to appetisers, salads and desserts are available. Even the rice is kept warm in individual bowls in a bamboo steamer. The dishes are specialities from all over the country, ranging from Kari Daging Masak Minang, Rebung Masak Cili Api, Ikan Pari Asam Pedas to Sotong Masak Sambal among others. Abdullah highlighted that the dishes were prepared with homemade sauces, not the ones off the rack. This is exemplified by the rich and flavourful sauce used for Rojak Buah, as well as the dishes’ different gravies that appeal with their respective unique flavour. Nyonya Kuih are often the highlight at the dessert corner but one should not miss the warm, creamy sweet congee prepared fresh daily. The delightful kampung buffet is also served throughout Ramadan, from 3pm to 10pm, at RM23 with drinks.